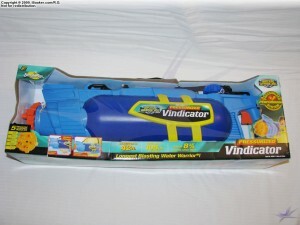 The Water Warriors Vindicator was the largest of the linear-style water blasters released by Buzz Bee Toys Inc. in 2009. As the big brother of the Water Warriors Equalizer, the Vindicator sports a five (5)-setting nozzle selector, shoulder strap, and an internal elastic pressure chamber. 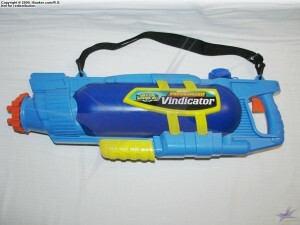 As one of the most potent water guns since the end of the CPS-brand of Super Soaker, the Vindicator was a sight for sore eyes. Sadly, its development and evolution was cut short, though there remains hope that we have not seen the last of this type of blaster. At fight sight, the Water Warriors Vindicator seems to be mostly tank (reservoir) and this observation would be quite accurate. With roughly 2/3rd of the water blaster taken up by the reservoir, little space is wasted. 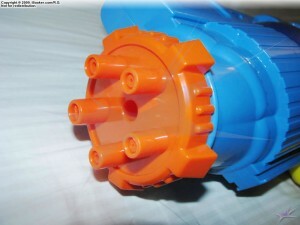 The remaining internal space is occupied by the pump tubing and nozzle valve assembly. 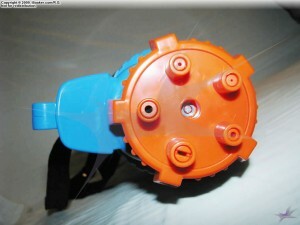 As the box clearly notes, the front-side nozzle selector offers five (5) settings to choose from while the trigger and grip at the back can be seen, but are somewhat obscured by the right-side of the box. 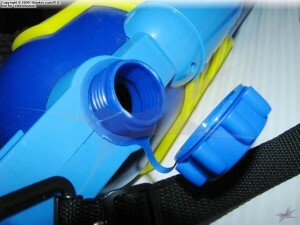 The pump grip, however, is completely hidden from this angle, though the reservoir cap as well as the Vindicator’s shoulder strap can be seen on the top. The box of the Vindicator, however, offered more than appears at first glance. As can be seen from this 3/4 view, the strap atop the Vindicator is not just visible, but can actually be used as a handle to carry the boxed water blaster, too! Moreover, while the trigger-grip area is obscured from the side, the large right-side panel’s purpose becomes apparent since the Vindicator’s box is actually open on the back to allow customers to grab hold of nearly the entire grip through the opening on the right-side of the box. Though the full feel of the Vindicator in one’s hands cannot be felt while still in the packaging, the size of the open grip allows one to test and confirm how this part of the blaster feels. Moreover, as is expected from the rear-position of the grip, the Vindicator is front-heavy and cannot be easily wielded single-handedly… or can it? 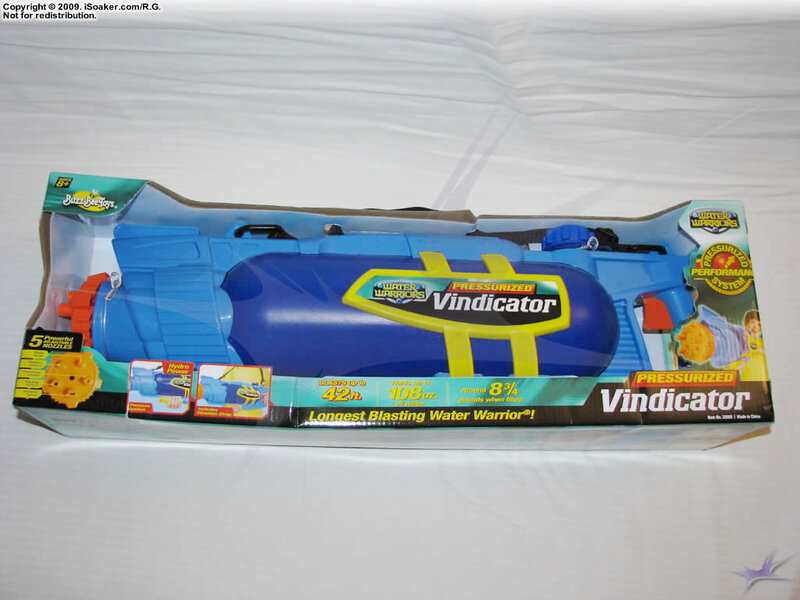 Free from its packaging, the Water Warriors Vindicator looks like some cross between a scuba-diving air tank and a water blaster. Outside its box, the Vindicator’s fully-tracked yellow pump grip is easily visible at the bottom of the blaster. The attachment points for the shoulder strap also become much easier to see. Pressurizing the Vindicator is smooth and easy with the Vindicator’s bottom-mounted fully-tracked pump. While the pump volume is lower than original Super Soaker CPS-class water blasters, it still does a decent job at getting the chamber up to pressure in a handful of pumps and filled soon thereafter. 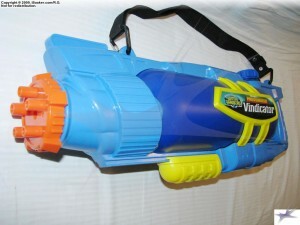 Due to the shape of the Vindicator’s frame, one ends up semi-cradling this water blaster when pumping. One thing that cannot be overstated is how solid the Vindicator feels as a whole. With no major extensions, a fully loaded Vindicator has a nice, solid heft to it, but none of its parts appears to be at significant risk if the water blaster were accidentally dropped. As noted earlier, the Vindicator features a nozzle selector with 5 nozzle settings: four (4) are stream settings and one (1) is a fan blast (a.k.a. Blasting Spray). What cannot be seen from the exterior of the body is the fact that the Vindicator has an internal elastic pressure chamber. That to the Vindicator’s full internal rubber bladder, stream output rates range from a conservative ~0.5x stream to a truly drenching ~6.7x stream. The fan setting pushes out a ~4x output, but is not as useful as the newer-style burst nozzles. As already noted, the Vindicator possesses an internal elastic pressure chamber. 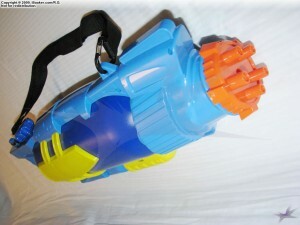 Perhaps the closest blaster in terms of size and performance is the original Super Soaker CPS 1000. 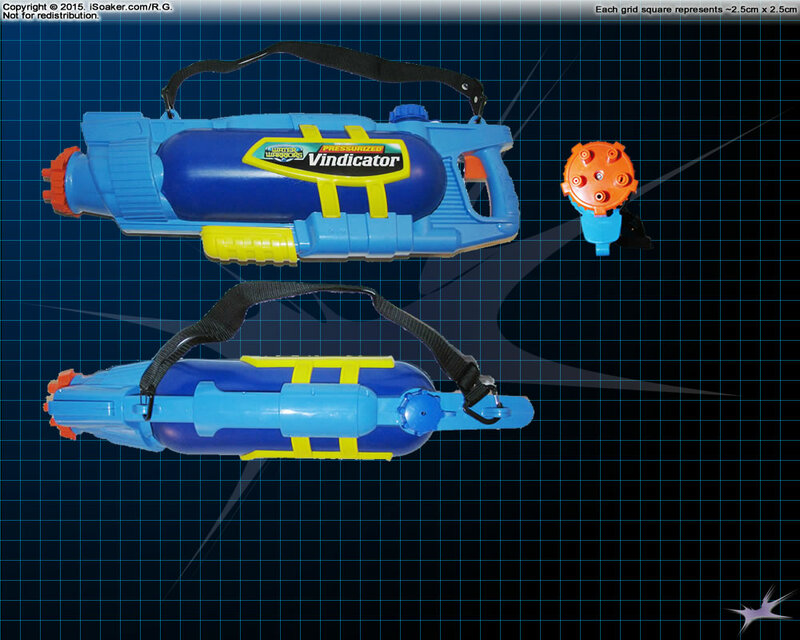 Comparing the Water Warriors Vindicator with the Super Soaker CPS 1000, the CPS 1000 wins out on pressure chamber volume and pump volume, but the Vindicator wins both on reservoir volume and maximum output. The Vindicator also has many more nozzle options, but these only really become useful when one wants to conserve water when running low; most Users will likely keep it set on its maximum stream setting most of the time. While the Vindicator is notably front heavy if simply holding onto its rear-positioned trigger-grip area, thanks to the inclusion of the strap, it is definitely possible to use a pressurized Vindicator single-handedly. With the shoulder strap properly adjusted, most of the Vindicator’s weight should be supported by one’s shoulder. 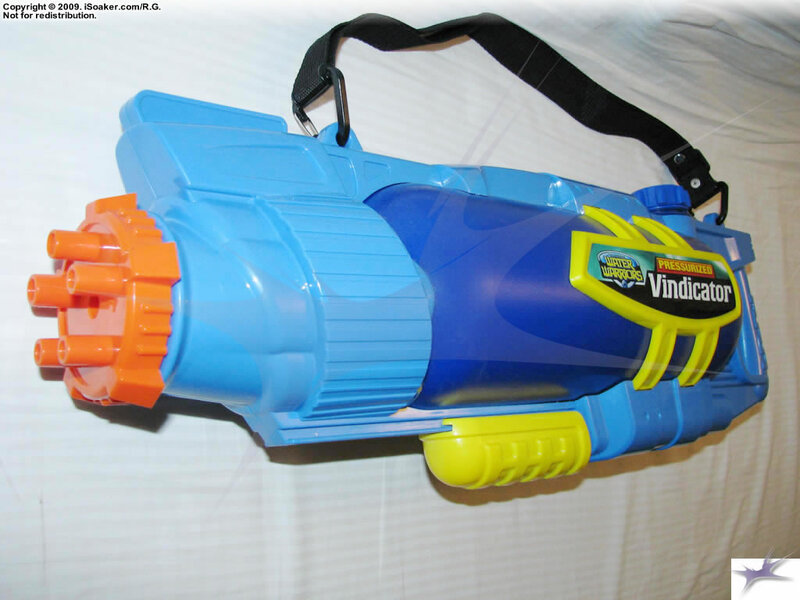 Of course, one still requires both hands to pump the Vindicator, but one’s pumping hand is not forced to continually support the water blaster once charged. Though the pressure chamber lies within the reservoir, since the reservoir occupies the bulk of the blaster, the Vindicator holds just slightly more water than the larger Super Soaker CPS 1500. Since the pressure chamber expands as water is drawn from the reservoir, there is no problem as the pressure chamber expands since water is removed from around it. However, as one may have guessed, it is not possible to do a fill-pump-fill to gain an additional full shot since the water level within the reservoir remains more-or-less level as the pressure chamber is filled. Like the Water Warriors Equalizer, the Water Warriors Vindicator’s next step in evolution was to be a version that was compatible with the Water Warriors “Ultimate” Series. Unfortunately, in 2010, Hasbro Inc. sued Buzz Bee Toys Inc. and Buzz Bee Toys Inc. ended up being served an injunction banning them from making trigger-based water blasters that used elastic-based pressure chambers. 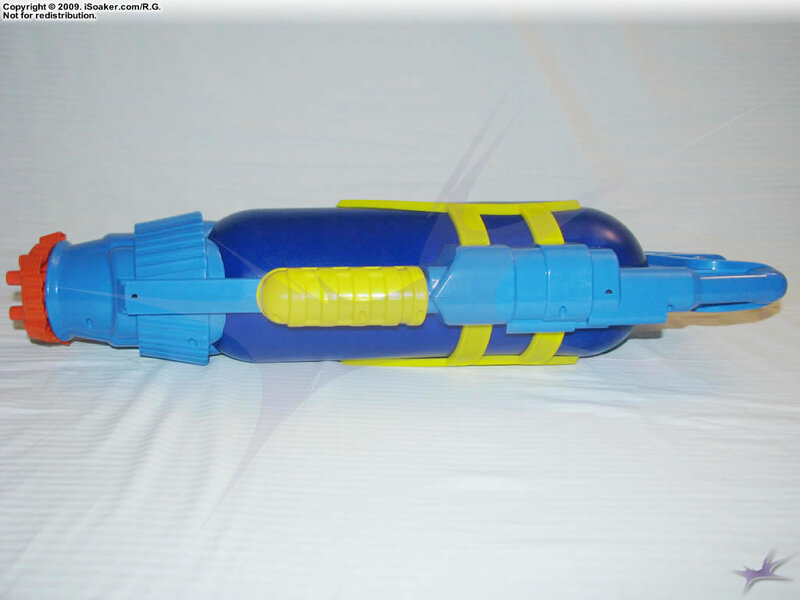 As a result, the Water Warriors Ultimate Explorer, though intended to have an elastic bladder within, ended up having an internal air-pressure chamber instead. 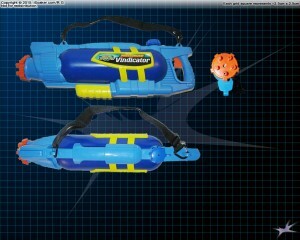 Ultimately, how good a water blaster is depends on how well it performs in battle and the Water Warriors Vindicator puts its best blast forward and keeps the pressure on. Keeping up with almost any other stock water blaster available, Vindicator Users will find themselves having solid output and range combined with good capacity, all within a nice, tight package. 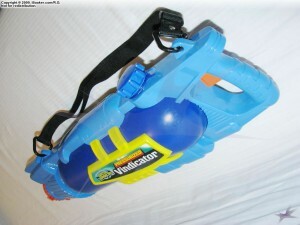 While the vindicator can be used with one hand and its shoulder strap, it is still more easily aimed using both hands, but the same is true for all larger water blasters. In the end, the Water Warriors Vindicator makes a great addition to anyone’s armoury. A truly solid build, minimal wasted space, good capacity, output, and range, and a solid assortment of water blasting options, perhaps the only thing that could be improved is swapping out one of the four stream settings for one of the newer burst-type nozzle settings. From my own experience, I used my Vindicator a fair amount after its release, but I’ll also admit that after 2009, the number of water fights I’ve had the pleasure of organizing and/or participating in has been few and far-between. 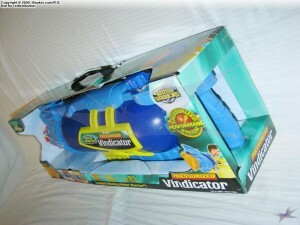 That said, it was unfortunate that the subsequent version of the Vindicator ended up stripped of its internal elastic pressure chamber, but here’s to hoping that a new Vindicator-type blaster will be released by Buzz Bee Toys in the future.